Having welcome bags for your out-of-town guests is always a nice treat. You can decide to have them for just those coming from out of town, or you can decide to make them up for all your guests staying the night. Not only do welcome bags make guests feel special at your event, but they often provide necessary items and information for the weekend! Now for a few Pittsburgh-themed ideas! 1. Delicious Favors of Popcorn, like Chocolate Caramel and Peanut Butter & Chocolate Kettle, from The Pittsburgh Popcorn Company (http://pghpopcorn.com/). 2. Heinz Ketchup or Pickle Ornaments from the Heinz History Center (http://www.heinzhistorycenter.org). 3. Tri Black Tee from 412 (http://shop.shopfouronetwo.com/). 4. Walking maps and shop/restaurant guide to Pittsburgh’s Strip District (http://www.neighborsinthestrip.com/). 6. Mini Jars of Heinz Ketchup and Mustard with Custom Labels from My Heinz (http://www.myheinz.com). 7. “Idea of Waiting” Chocolate Bars from the Andy Warhol Museum (http://www.warholstore.com). 8. Vodka Pasta Sauce from Penn Mac (http://www.pennmac.com). 9. Pittsburgh Penguins Golf Ball from The Pittsburgh Fan (http://www.thepittsburghfan.com/). 10. 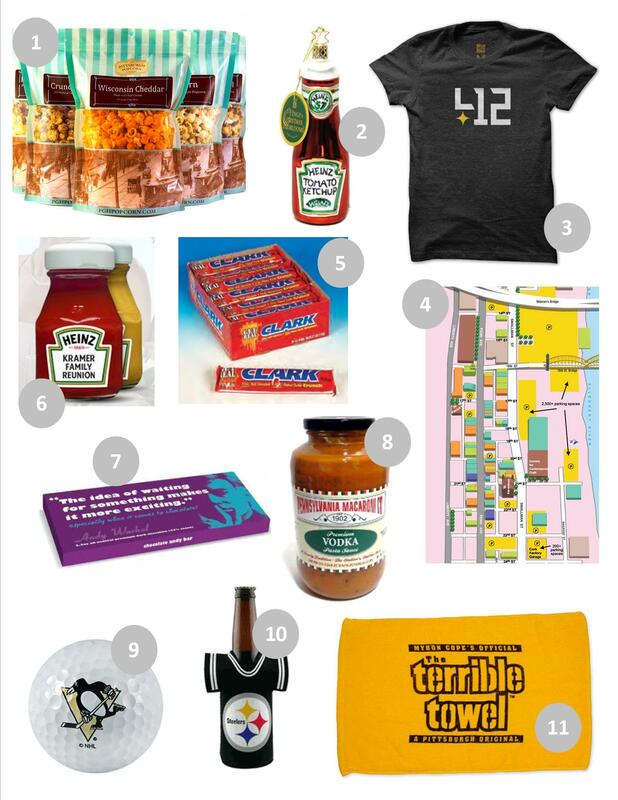 Steelers Bottle Jersey Cooler from My Favorite City (http://www.myfavoritecity.com/stboje.html). 11. Official Steelers Terrible Towel from The Pittsburgh Fan (http://www.thepittsburghfan.com/). For even more ideas, check out this list of 100 things to include in a Welcome Bag from Pittsburgh Bride Talk. Need help coordinating your welcome bags (among other things) for your wedding? Give Hello Productions a call (412-298-7333) or Request a Quote! Think square, triangles, concentric circles and more – don’t worry, we’re not talking about math! We’re talking about this summer’s hot trend – geometric shapes! From geometric shapes on cakes to patterns on invites and dresses, we think this trend is a lot of fun, especially when you use a lot of colors! We love these fun invitations and geometric inspiration board from Botanical Paperworks Blog. How great are these geometric cakes?! Use uniquely shaped jars for your candy bar or you can go all out with geometric-shaped foods! And no event is complete without adorable geometric favors such as these!